What % of people would prefer a prestigious degree without having to attend classes. Vs what % would prefer the classes of the prestigious colleges or universities without caring for the degree. 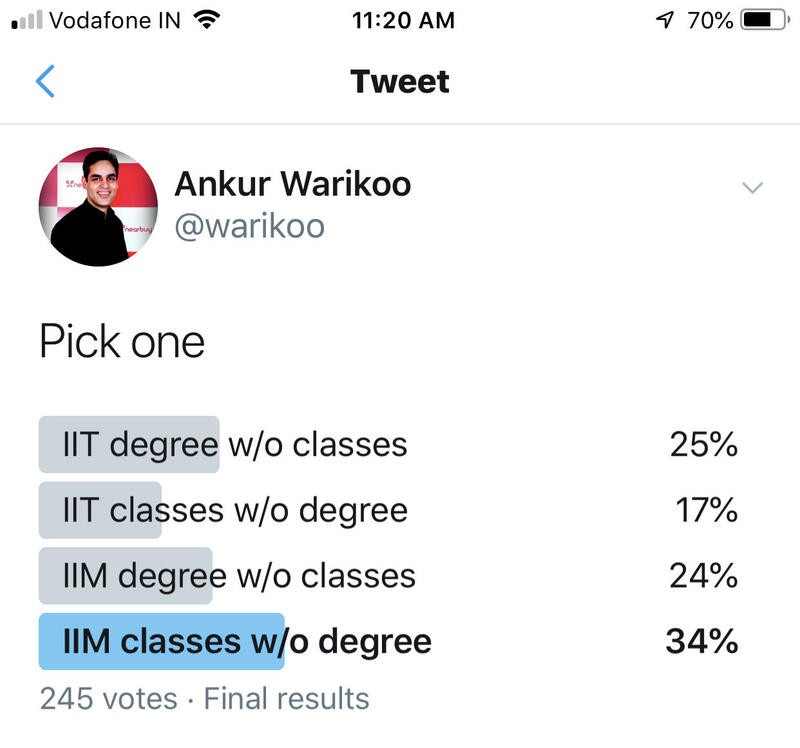 Among those whose primary motivation is degree(not learning), they have a stronger preference towards IITs over IIMs - indicating IITs have a higher brand value compared to IIMs. 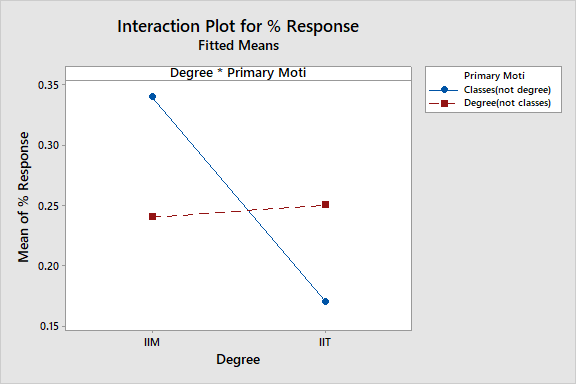 Among those whose primary motivation is learning(not degree), they have a stronger preference towards IIMs over IITs - indicating subjects at IIMs are seen as more relevant topics to learn. This is a point of introspection for IITs. The detailed analysis with step by step "tutorial like" explanation is given below. 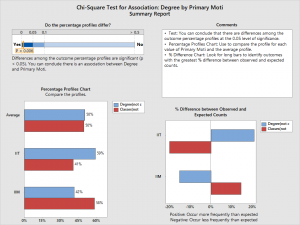 Structuring the data from the survey would look something like this in Minitab worksheet. 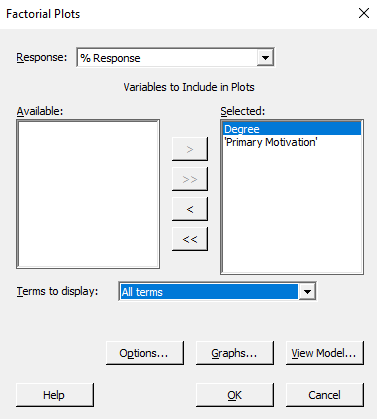 Go to Models, and select both "degree" and "Primary motivation", set interaction through order = 2 and click add. 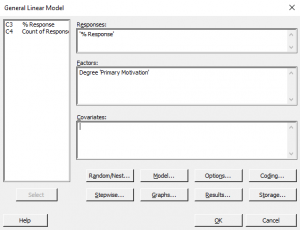 The Degree*Primary Motivation term will get added to the model. 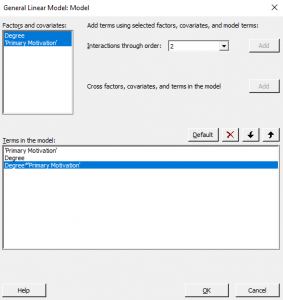 In terms to display, select "All Terms", and click ok. You will get two graphs. Thee first one is the main effect plot. This plot analyzes the relative effect of each of the factors, resulting in variation in the response. 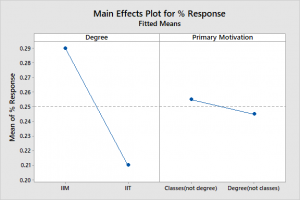 The left plot - compared to factor of "primary motivation", in case of the "degree" factor - remarkably higher % of people have a preference towards IIMs over IITs. Opinion: This could be more representative of people responding on Linkedin, (sampling non-homogeneity). Suggest similar study using a different medium, for example via tele-calling. 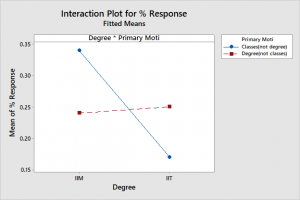 Now, the other graph generated is called interaction plot. This plot analyzes, the effect of one factor, keeping the level of another factor constant. 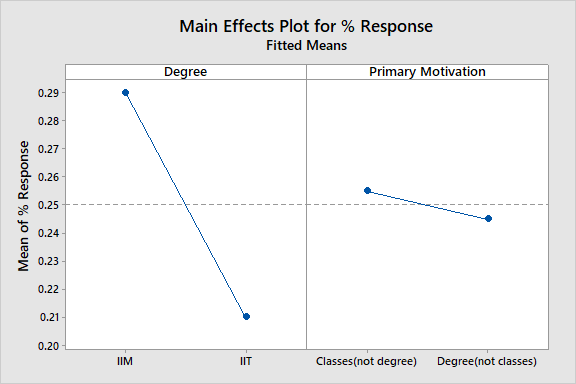 The blue line indicates that those who have a primary motivation of learning, i.e classes(not degree), prefer IIMs over IITs. If the sampling is truly random, this is a pretty interesting insight. 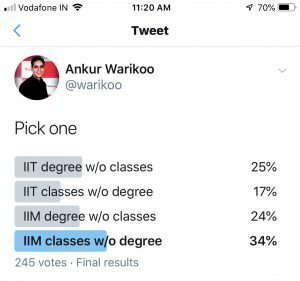 It seems, IITs have a higher brand value compared to IIMs, however, more people think the subjects taught at IITs aren't as relevant or have practical significance. This should be a point of introspection for the IITs.Please re-look in to the academic curriculum. Are the IITs grossly under-utilizing 4-5 years of the most brilliant students you filter though JEE? Are the IITs' subjects relevant to today's context? It also seems that more people value the learning (or maybe networking) opportunity at IIMs than at IITs, however, the brand value of IIMs lag behind IITs. This should be a point of introspection for MBA aspirants. 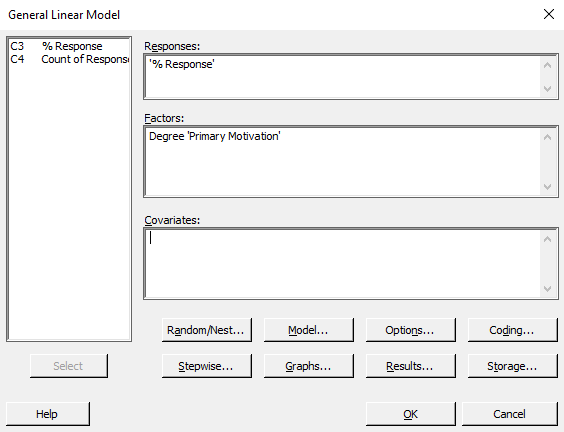 Yeah, I assumed a discrete (count) response as continuous and modeled it, which is not perfect! I may not have used the perfect statistical tool for the analysis. 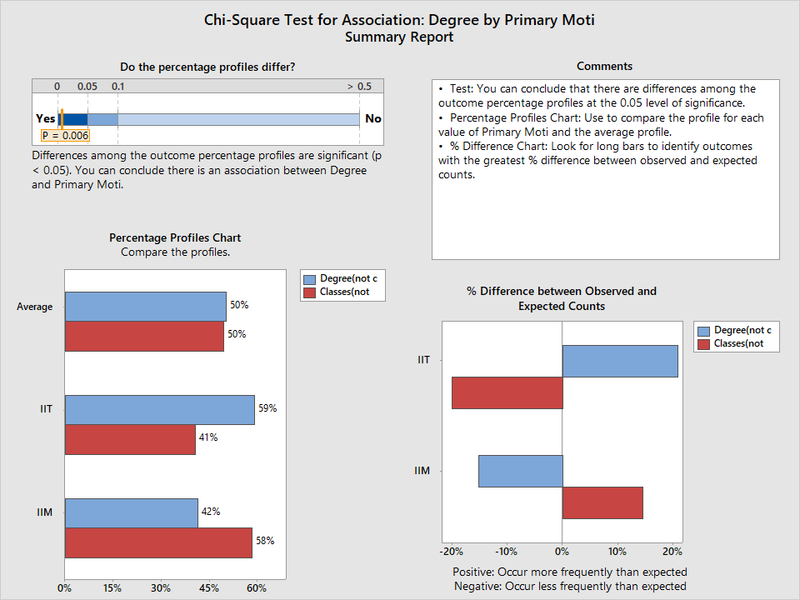 But if you were to do a chi-square test for association (which I think is more difficult for people to understand), your interpretations wouldn't have change! Here it is for you to mull. Hope you enjoyed this. Appreciate your comments! Samvit Co-founded Leandigit. Samvit is a Mechanical Engineering graduate from IIT Kgaragpur. He has 10+ years of cross industry experience including Automotive, FMCG, eCommerce and Consulting. During his previous stints Samvit has led teams in product development, operations, quality and operational excellence roles. Currently Samvit consults many organizations and helps them solve some of their most complex problems. Contact us to get an appointment with Samvit.